Do you ever have the feeling that you’re leaving somewhere to which you’ll never return? You’ve been coasting along in the present, then all of a sudden—the future! Is here! There’s no going back, no matter how much you want to. You walk out of the apartment and shut the door for the last time. You leave the university campus after years of study. You change jobs and say farewell to the workspace. That place was so important to you, but now it’s no longer part of your life. If you ever do go back, it’s never the same. You might feel like a conquering warrior (“I remember when I first arrived here, and look at me now!”) You might feel sad or regretful (“I wish I had…”), or you might have only good memories. Either way, change is the constant, and things are going to be different from now on. Sometimes you don’t even see it coming. It just hits you all of a sudden: change is ahead! Be aware that this moment is passing soon, and your life will never be the same. Sorry, but you don’t usually have a choice in these matters. When saying goodbye to a person or place, some think it’s best to leave things unsaid, or walk away without reflection. I’ve learned that this is usually a mistake, at least for me. I say: hold on to the moment as long as you can. Fight for it if you have to. Get up early and stay up late. Be brave. Choose the raw emotion, even the awkwardness if necessary. If we must go on to something else, let’s at least think about what was and what could have been. The more intense the feeling, the better. If synchronicity and the feeling of being part of something meaningful comes with sadness, loneliness, and disappointment, so be it. I just know that I don’t want the alternative—mediocrity, routine, the safe and the comfortable. I often get this feeling when preparing to leave places as I roam the planet, even if I wasn’t that attached to them while I was there. Two years ago I went to Easter Island, thousands of miles out and six hours by air from South America. I enjoyed the visit, but as a tourist destination, it’s a long way to go for a small island with little to do. I’m not buying a second home in Easter Island, in other words. But then—on the eve of my departure, I looked up at the sky and realized how far I was from everywhere else in the world. I also realized I would likely never return and thought, I’d better remember this. I joke about collecting countries the way some people collect postcards, but really I’m collecting experiences like these. “Is it worth it to spend so much money on travel?” I’m sometimes asked. I don’t really think of it as paying for travel itself. I’m paying for memories, and when it comes to spending on memories, I say yes. Most definitely. I have no credit limit for memories. I felt this way while leaving Tbilisi, Georgia a few months ago. It’s truly a beautiful city, and one of the best in Europe, no doubt. The intensity of it all was almost overwhelming to me. I wasn’t ready to say farewell, but I also knew that staying another day wouldn’t make it any better. I ran ten kilometers the night before I left, trying to process the experience. The next morning, I rode in the mini-bus to Armenia, my next stop, and thought about it further for a good six hours or so. I had been reading Don Miller’s new book on this trip. Among other things, Don says that meaningful lives do not just happen by accident. They require conflict, risk, striving, and overcoming. A good character in a story has to struggle, and so it is with all of us. That’s why I think it’s good to embrace the transition points. Don’t go to sleep to dream. You can dream all day long without ever closing your eyes. After making it to the next hotel, though, I laid down on the bed for a short nap at 4pm. I woke up 10 hours later, still feeling disoriented. I made coffee and did some writing. Inevitably, I know that we all have to look forward instead of backwards. In the pursuit of growth, it’s better to choose the new than the old. But sometimes it’s also good to hold on to something for a while, and then you can treasure it as the memory it becomes. Embracing reality may be exhausting, but I can’t imagine the alternative of avoiding it. Seaglider drones collect valuable data as they travel deep underwater. Researchers are employing iRobot’s Seaglider unmanned underwater vehicle (UUV) to monitor the damage caused in the Gulf of Mexico by the Deepwater Horizon Oil Spill. The six foot long autonomous robots are capable of operating for 10 months on their own, monitoring water conditions down to 1 km (~3300 feet). They periodically resurface to transmit data via satellite. Current Seagliders in the Gulf are tracking temperture, salinity, dissolved oxygen, and presence of organic compounds (oil). Data analysis and technical support is being handled by Vernon Asper of the University of Southern Mississippi and Craig Lee of the University of Washington. Seaglider data may prove to be a valuable asset in dealing with the ongoing environmental crisis in the Gulf. 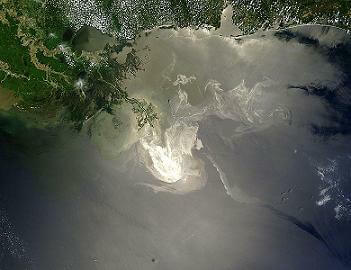 The scale of the Deepwater Horizon Oil Spill is monumental. Millions of barrels of oil have already been released into the Gulf of Mexico habitat, and more continues to leak from secondary holes in the system. While no one is able to predict the environmental impact this disaster will have on the region, there’s a nearly universal agreement among experts that it will have a serious and negative impact on marine wildlife, fishing economies, and coastal wetlands. In order to respond to the crisis, scientists and leaders need up to date information about where oil is headed, and in what quantities, in order to coordinate countermeasure and relief efforts. This picture, taken by NASA, shows the enormous size of the oil slick caused by the Deepwater Horizon Oil spill.. To give you an idea of the size, that's the 'boot' of Louisiana in the upper left part of the image. The Seaglider can last so long underwater (up to 10 months) because it doesn’t rely on traditional propeller systems. Instead, it ‘glides’ through different ocean strata using changes in buoyancy. It also collects data as it moves through these different levels, allowing it to provide valuable insight into what’s happening far below the surface of the water. 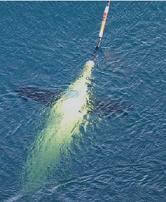 A few times a day, the UUV surfaces and uses a meter long antenna to transmit data and receive instructions. Being able to send an autonomous drone to measure variables at different depths is of great use in this recent oil spill. Deepwater Horizon has released oil droplets throughout the Gulf, and the Seaglider has detected clouds of this crude as far down as 700 meters. Researchers like Asper and Lee can use an internet-based interface to control the Seaglider and direct it to different locations and depths as needed to get a a better picture of how the crude oil is dispersing. Meanwhile measurements of temperature, dissolved oxygen, and salinity give the scientists some idea of how marine life would fair in the region even without direct measurement of a species. It will likely be many years before we fully understand the economic and environmental impact of the Deepwater Horizon Oil Spill, but much needs to be done in the short term to stem the devastation it could cause. To that end, the Seaglider robot is a great technology to assist in the response effort. More information is always good in situations like this. In the future, advanced technologies will become an increasingly visible part of disaster relief and recovery, not only helping to collect valuable data, but also direct civilian response. Moving forward I hope that we use accelerating technology to not only react to ongoing crises, but help prevent them. With a little intelligence (artificial or otherwise) many of these disasters could be avoided. Not just my head, but your customer’s head and yes… yours. The ego–seeks applause and recognition. The lizard–seeks safety, wants to fit in and not be rejected or criticized. The artist–wants to be generous, creative and make positive change with impact. The boxer–wants to poke and be poked, seeks revenge and ultimately victory. The zombie–wants to turn off and be entertained. The carpenter–seeks to do useful work, and finish it well. The philanthropist–wants to help, anonymously. The evangelist–wants to spread an idea. And the hunter–wants to successfully track and bring down a target. There’s a lot of overlap here, no doubt about it. Who’s winning? Custom made by Hermès for the author of Out of Africa, the 2 cases below show the excellent craftsmanship of the French luxury brand. Made in 1930, when you had to be way more prepared when you traveled than these days. No 7/11, Duane Reades or airport shopping areas meant you couldn’t afford to forget anything. We could also mention the time it even took to travel back then but judging by his choice of luggage, this guy traveled well! All 1,472 employees of Facebook, Inc. reportedly burst out in uncontrollable laughter Wednesday following Albuquerque resident Jason Herrick’s attempts to protect his personal information from exploitation on the social-networking site.